On the healthy recipe spectrum, this one ranks pretty well. Low-fat shrimp, wholesome grits, nutritious bell pepper and nori, and a dipping sauce made mostly with yogurt means this sushi is good for your tastebuds and your waistline. Start by cooking your grits. I used my rice cooker, and some local Wade’s Mill grits that are coarse and hearty. I wouldn’t try this with instant grits – you need them to be thick. 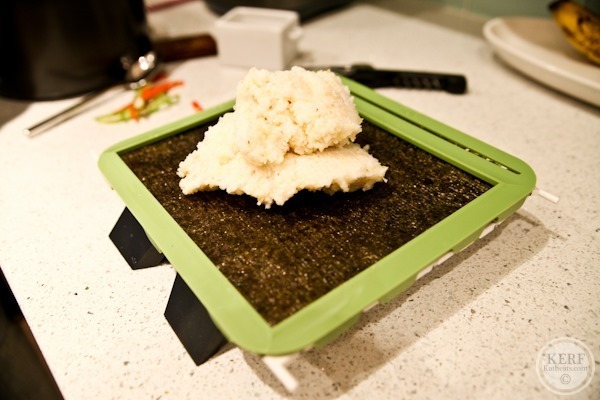 Put down your sheet of nori (found at most grocery stores in the Asian section) and spread your grits out nice and thick. Followed by a row of cooked shrimp. Stretch them out a bit so they take up less space lengthwise. Then roll ‘er up! There are lots of You Tube videos on this if you need some some more visuals. It’s really not that hard to do! And cut into 8 segments. This recipe makes 2 rolls of 8, so double it for a crowd. The dipping sauce is key, as it gives another punch of Old Bay and is a wonderfully creamy balance to the shrimp. 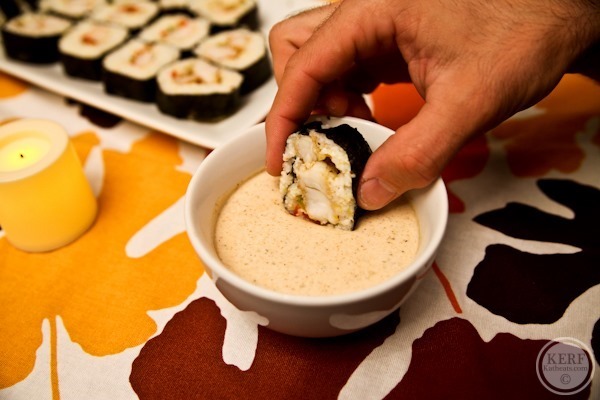 This is a Southern twist on sushi - shrimp and grits style! Cook grits in your preferred method. I like to use a rice cooker on porridge setting, but you can also make them easily on the stove top. Follow the directions of the brand of grits you buy. Allow to cool slightly so they are easier to work with and a bit sticky. Toss shrimp in a few pinches of Old Bay. Heat skillet to medium high and add cooking oil. Saute shrimp until they form a nice crust. 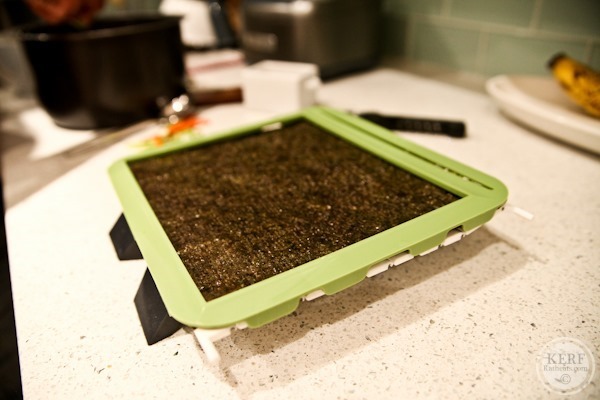 Place a sheet of nori on your sushi mat. Spread grits out about 1/4 in. thick to all corners. Place peppers and shrimp about 1/3 of the way down. To get you even more pumped for party season, I have an awesome giveaway from The Shrimp Council! In the spirit of gift-giving, you’ll have the chance to win a Rachael Ray 10 Piece Porcelain Cook Set. This set has all of the basic cookware shapes and sizes that will help bring shrimptastic inspiration to the holiday season, along with a super-stylish excuse to eat, drink and be merry. I love the teal! For lots more holiday shrimp inspiration, check out Eat Shrimp on Facebook and Pinterest! Thanks to The Shrimp Council for sponsoring this post! shrimp cocktails! i love tomato-y things, so the cocktail sauce makes the dish for me. This sounds so awesome! Someone could just spoon feed me that Old Bay dipping sauce, and I’d be a happy girl! 😉 I don’t know that I can think of any mind-blowing shrimp appetizers I’ve had, but this one might just do it! The sushi looks great! What a fun idea. I love a simple shrimp cocktail for appetizer. But coconut shrimp with an orange marmalade dipping sauce is also a favorite. Shrimp cocktail is my favorite appetizer! My favorite shrimp appetizer is shrimp cocktail! I love it with a good cocktail sauce! I love shrimp, especially grilled. 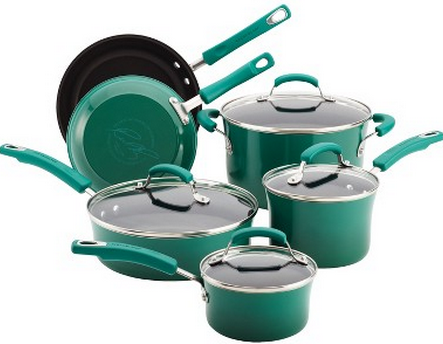 Also love the color of that cookware! My favorite shrimp appetizer is shrimp cocktail, but if I’d ever tried something like shrimp and grits sushi that would be bound to take first prize. Yum, looks good! I love shrimp and grits. My family always makes an appetizer of baby shrimp mixed with cocktail sauce poured over cream cheese and served on triscuit crackers. It is one of those foods that brings back childhood memories! My absolute favorite shrimp app is shrimp ceviche! This summer we vacationed on the Outer Banks of North Carolina and made incredible fresh shrimp ceviche with loads of avocado and lime! I love a basic shrimp cocktail!! But I will definitely have to try this recipe out! OH WOW! This looks INCREDIBLE!! 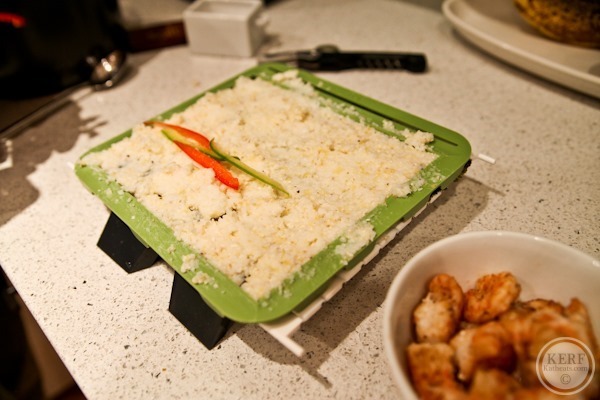 I love making homemade sushi, but this is such a creative take on it! Can’t wait to try. I love coconut shrimp. I don’t eat them often but they’re so good! I love taking a skewer and adding shrimp, a piece of pineapple, wrapping it in bacon, giving a smear of BBQ sauce and grilling it up! shrimp cocktail – easy and delicious! 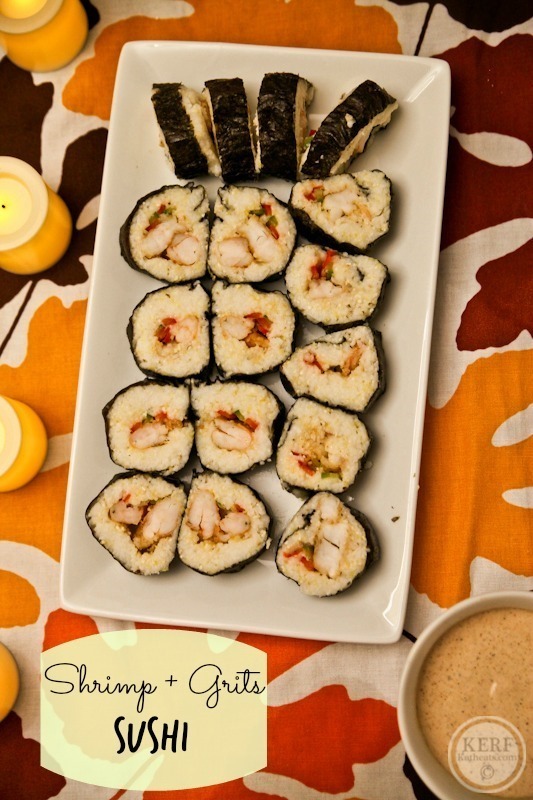 Sushi is one of my favorite foods, & this is a great twist! Can we talk about that teal for a minute? So pretty! Delicious! I’ll be adding this to the Holiday food roster! I absolutely LOVE shrimp scampi! I love the basic shrimp and cocktail sauce!!! Such a creative idea for a meal! This is crazy creative! Haha my favorite shrimp appetizer is just shrimp cocktail! A classic shrimp cocktail is still my fave. Simple and delicious. I like peel and eat shrimp with cocktail sauce-homemade is best! 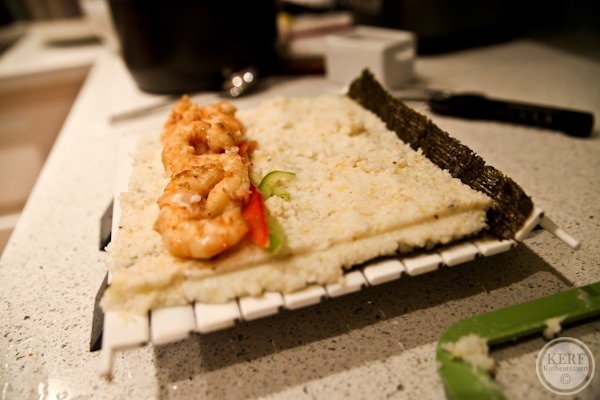 I love shrimp and I love grits and I love sushi so I will be making this recipe asap! Peel n eat shrimp at our local gastropub. Yum! I just love the classic shrimp cocktail appetizer! I’ll have to make this soon! If I win, these will be going to my son who recently got his own place and could really use them. My favourite shrimp recipe is good old BBQ’d shrimp… served hot with extra BBQ sauce! Sounds delicious!! 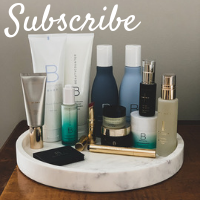 And love, love, love the giveaway!!!! Classic shrimp cocktail. Simple and good. I like the deep-fried butterfly shrimp best! Now I’m craving shrimp cocktail! This looks fun to make with kids too. Can we hang out? You go to the coolest places and. make the coolest things. that sauce? I could eat it by the spoonful. that sushi? I WANT. TO INHALE IT. shrimp cocktail is hard to beat! That looks delicious! I doubt I’m gonna go out and buy a sushi roller and all that, but if I ever happen upon shrimp and grits sushi I’ll try it. I love the traditional kind, especially South Carolina style. Vietnamese Fresh Shrimp Spring Rolls! I love shrimp cocktail – for some reason it feels so festive this time of year! I love a simple shrimp cocktail – but this is perfect for a little fancier different app. Perfect timing for the huge bag of shrimp stashed in the freezer! I’m not a huge shrimp cocktail fan so I’d go with a shrimp veggie stir fry! Shrimp cocktail never gets old. Great in all seasons! 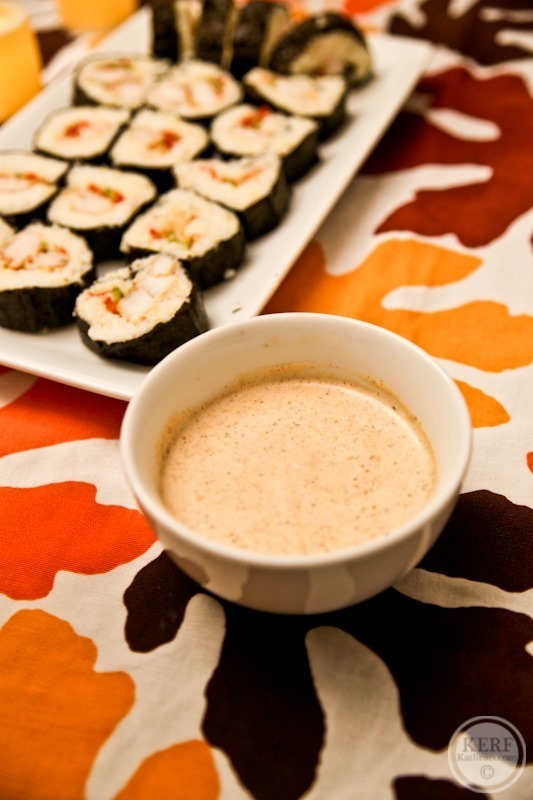 This recipe looks awesome…I’m pretty sure my husband would want to drink the dipping sauce! 🙂 And, I’m in the market for some new cookware, and this set would be great! This is so creative! I’m all about the tequila lime marinated shrimp. Especially in the grilling months. But since it’s getting cooler maybe an olive oil poached shrimp with a winter pistou or a curried shrimp and butternut squash soup. Looks delicious! I can’t wait to make this at home. I love the basic shrimp cocktail, but I think this sushi could become a new favorite. What a great idea! I agree– can’t go wrong with a good shrimp cocktail. These rolls look great, too! shrimp cocktail around the holidays! Pretty typical but I LOVE shrimp cocktail. I love to make my own cocktail sauce with big chunks of avocado and tomato in it. So good. Shrimp ceviche has always been a favorite of mine. I love simple shrimp cocktail! Call me boring, but I LOVE shrimp cocktail! I love curry shrimp and avocado, but this is so creative! we love all things shrimp!! this looks so easy, even I might try it!! Bang bang shrimp made with Chile Crunch! Good ole shrimp cocktail! It never disappoints. 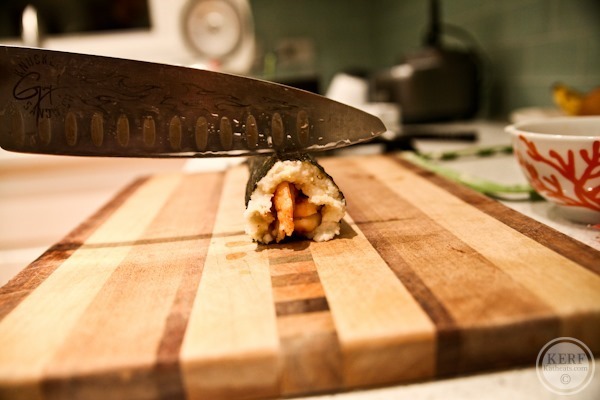 Ooo you make sushi rolling look so easy! I always fail miserably haha. Confession: As a former New Yorker, I never had grits before! I like traditional shrimp cocktail but this looks like a fun alternative! I really love a classic shrimp cocktail. I am super excited to try these shrimp and grits rolls! My favorite shrimp appetizer is just plain cocktail shrimp with cocktail sauce. So delish! I love buffalo fried shrimp! This looks wonderful! I would love that set of pans!! I’ve never tried making Sushi myself, would love to! this looks delicious! i made grits for the first time last week! Yum, this makes me crave sushi! This recipe sounds incredible!! And the dipping sauce?! Yum! My favorite shrimp appetizer would probably be some form of sushi with shrimp. I love a good shrimp cocktail. Especially on/near a beach! That roll sounds amazing! I love the color of the cookwear too! Bacon wrapped shrimp for sure! I’m allergic to shrimp! But my hubby loves this, so I saute them in butter when he’s craving them! My favorite shrimp appetizer is coconut shrimp. My stepdad makes a mean steamed jumbo shrimp appetizer. He seasons them with Old Bay and them steams the shrimp with beer. Dunk in a spicy cocktail sauce and its AMAZING! Dynamite shrimp from a very popular restaurant chain. That recipe sounds amazing! But I REALLY want to know where you got that fabulous tablecloth!! It’s a Crate + Barrel dish towel! Wow that looks so delish! I’d love the chance to win that set. LOVE the teal color. All my pots and pans are random pieces from grandparents etc so it would be nice to have a full matching set. Ceviche, the best ever at our local Mexican rrstaurant! Shrimp cocktail with super spicy cocktail sauce! this looks delicious! i was racking my brain to think of multiple shrimp appetizers, but could only come up with wontons, spring rolls, and shrimp cocktail: all good! I love regular shrimp cocktail as an app! my favorite shrimp appetizer is chilled shrimp with cocktail sauce. I like bacon wrapped shrimp! Mini shrimp tacos – shrimp cooked with lime juice and red pepper flakes, served on little tortillas with avocado, onion, and tomato. Really good! My brothers and I are fans of a good ol’ shrimp cocktail and I love shrimp in ceviche. I love pan fried or grilled shrimp as an appetizer! YUM!! This is amazing and creative 🙂 I also love shrimp cocktail, but grilled shrimp skewers take it for me! Classic shrimp cocktail is my fav! Love the color of the set. I am not a huge shrimp fan but I would find dozens of other things to cook! Can’t go wrong with shrimp cocktail. But I also like them skewered and seasoned with Old Bay! Shrimp and grits AND Rachael Ray cookware- 2 of my favorites! I love plain old plain old bolied shrimp (peel and eat) with coctail sauce. It doesn’t get any better than that. I love all kinds of shrimp! Grilled shrimp is awesome, but I also love cold shrimp cocktail! I’ve only had shrimp a couple times being from Nebraska. I enjoyed the coconut shrimp and shrimp scampi! coconut shrimp does it for me. Or, a nice easy brazilian dish with tomatoes, a touch of cream and shrimp is tasty treat and quick meal with rice. My favourite shrimp app has got to be rice paper rolls loaded with cucumbers, cilantro and peanut dipping sauce. So good! These looks delicious! Definitely have me craving sushi!! Was this a time intensive recipe? I always think sushi would be pretty time consuming to make. It was actually really quick! 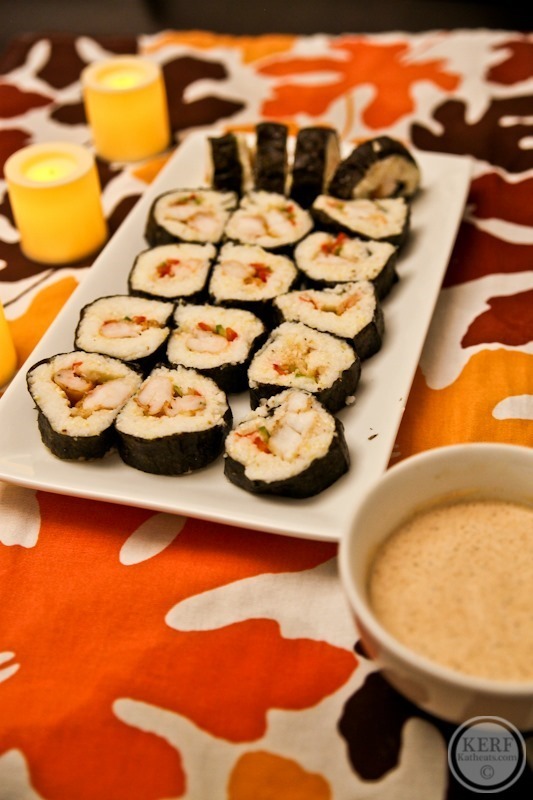 The rice cooker helped with the grit-making, and we just had to cook the shrimp and roll them up. 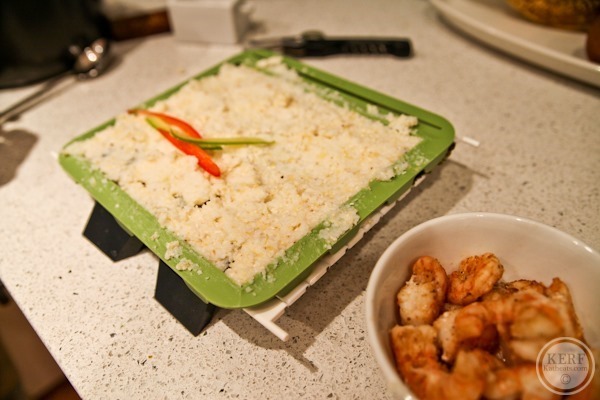 One of my favorite shrimp appetizer is a dip with cream cheese layered on the bottom, cocktail sauce layered on top of that and little shrimp placed on top. Dip with crackers. Simple yet delicious. 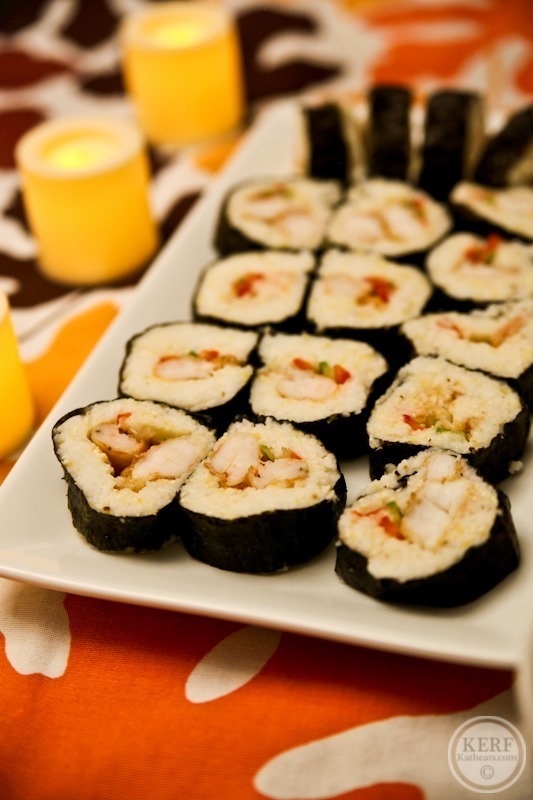 I will be trying this sushi though for a dinner partying I have coming up! I seriously think this is the coolest idea ever. Shrimp and grits is my mom’s all time favorite meal so I have to make this for her! Thanks! I love having southern roommates who introduced me to the deliciousness that is shrimp and grits! Boy, I could really use a new set of cookware…..
That is super cute! I’m a Southerner living in California, so I often try to do Southern “fusion” food for my parties. This is so going on the menu for my next party. I really like cold boiled shrimp with cocktail sauce. Simple and good. It’s all mine at home too because nobody else in my house likes shrimp. I know! They don’t know what they’re missing. I like to serve this at my extended family get togethers. Coconut shrimp is always a winner in my book!! I love just the classic shrimp cocktail – with extra cocktail sauce! But this recipe sounds amazing! I have never seen pots and pans that color! So cool! Torpedo shrimp are a favourite appetizer – shrimp wrapped in rice noodles and fried to crispy perfection! It just took us a year to remodel our entire kitchen. These pots and pans would be a great addition to the new room! i love the barefoot contessa’s roasted shrimp cocktail! I love regular ol’ shrimp cocktail, but this sushi looks so interesting! I love shrimp & grits and I love sushi, so there’s no way I can go wrong with this. I’m from the low country of South Carolina and love shrimp prepared just about any way; although lately, Ceviche style has been a favorite! What a fun idea!! I love shrimp for quick easy dinners. One of my favorites is making shrimp tostadas – baking up some tortillas and loading up with veggies, avocado and shrimp! I really like coconut fried shrimp! Smoked shrimp is so delicious! My favorite shrimp appetizer is good old Shrimp Cocktail. My brother in law makes it with a wasabi cocktail sauce that is out of this world! I LOVE shrimp! Any shrimp appetizer! Buffalo Shrimp and cajun Shrimp are my favorite. I really enjoy coconut shrimp, but I know it’s not great for the waistline–especially with that delicious pineapple and coconut sauce. When at home, a simple shrimp cocktail will do. My favorite shrimp appetizer is an Ina Garten recipe for a spicy BBQ shrimp with a fresh Mango salsa ! I’m a big fan of shrimp ceviche! ceviche is so light and fresh! I love shrimp cocktail- the hotter the better! This looks awesome! I never make appetizers with shrimp, what a cool idea. ceviche is so light and refreshing! That looks amazing!! I always love trying new appetizer recipes..it gets me into the holiday spirit to think of all the awesome parties! I love sushi and shrimp! Looks delicious! This made me so hungry for some shrimp! I love shrimp cocktail! Shrimp cocktail is my favorite appetizer as well as my favorite way to eat shrimp. I often order it as my entree when we eat out. Love shrimp, just sad that I have a very low sensitivity to it, at least I haven’t had to eliminate it completely. For shrimp appetizers, seafood bruschetta, bacon wrapped crab stuffed shrimp, or our all-time favorite Dill Havarti-Shrimp Appetizers (cocktail bread toasted with honey mustard, melted havarti, shrimp, red pepper and dill. Making shrimp for dinner and wish I could make this, but will settle for cauliflower fried rice with shrimp and pineapple. I’ve never had grits. I know, right? They’re on my to-try list, but I’m a bit nervous about trying them for the first time at home. Polenta too. I’ve gotta get over the nerves and just try them both. I do like a nice shrimp cocktail. It’s a toss up between the classic shrimp cocktail and cream-cheese and crab stuffed shrimp. Both REALLY good! Simple and classic. Jumbo shrimp cocktail with a spicy cocktail sauce! My fav shrimp appetizer is mango shrimp salad in crispy wonton cups. I don’t eat shrimp, but I do love veggie sushi! The teal color is beautiful. This recipe looks SO good! I would love to try it sometime! Shrimp stuffed mushrooms are my favorite! We have cheesy shrimp canapes every New Year’s Eve. One of my favorite and most delicious traditions. wow! that’s impressive. i’m from the south and grits is a favorite- i need to make that soon! forgot to include my email on my last comment! I love pretty much any kind of shrimp, but my favorite is coconut shrimp! What an awesome and creative recipe! Sounds delicious!! I love shrimp wrapped in puff pastry! 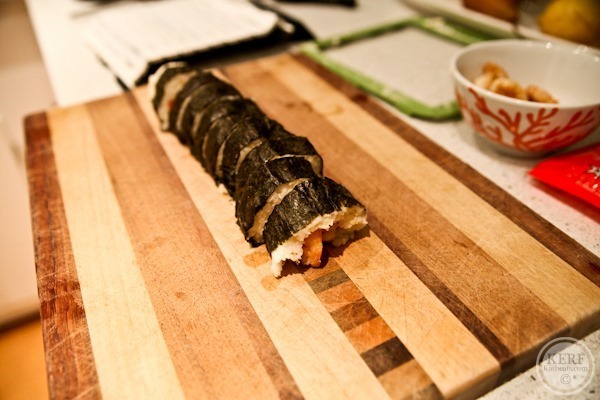 What a cool idea…I love making sushi at home and will definitely have to try this spin! 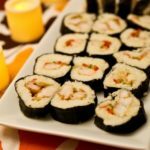 I think this recipe could also be perfect for introducing sushi to those who are little apprehensive about giving it a try. My favorite shrimp appetizers are shrimp cocktail or any kind of grilled shrimp on a skewer. My favorite shrimp app would be a tie between classic shrimp cocktail and Bonefish Grill’s Bang Bang Shrimp. I love simple shrimp cocktail. It is healthy and delicious. Once I had a delicious grilled shrimp appetizer with a local peach salsa – I still remember it well! My favorite shrimp app is spicy coconut shrimp, YUM! I’m vegan but these sound like a creative appetizer! Shrimp and cream cheese dip with cocktail sauce and yummy crackers! I love the simplicity of chilled shrimp with homemade cocktail sauce! Ceviche! And Bang Bang Shrimp! What a creative appetizer! My favorite is shrimp cocktail with a spicy cocktail sauce. I love a sesame-marinated grilled shrimp kabob as an appetizer. Delicious, healthy and easy! Shrimp cocktail – it’s classic and perfect! I love a good old fashioned shrimp cocktail. Reminds me of Christmas parties! This looks really tasty. So creative! shrimp masala with white basmati!!! Hm I’m not sure if I have a favorite shrimp appetizer, your recipe looks great though! Bang bang shrimp is my favorite shrimp meal, I love how sweet eats recipe. Classic Shrimp Cocktail – Yumo! Simple and fabulous! Thanks to you and The Shrimp Council for the incredible giveaway! Shrimp cocktail never gets old in my opinion! What a great idea! This looks delicious! Classic shrimp cocktail is my all-time favorite! I had a pretty tasty shrimp ratatouille-esque dish for brunch recently and it hit the spot. That’s extra good news because I didn’t used to like shrimp (it’s a texture thing)! Oh my goodness that looks so delicious! 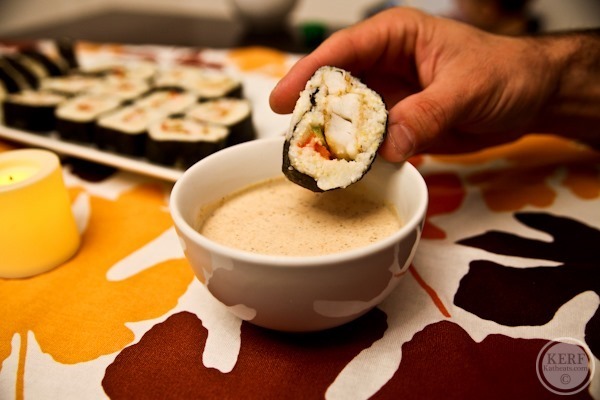 Love making homemade sushi – we often make ours vegan (just because it’s easier, ha) with shiitake mushrooms and avocado, and a sauce out of veganaise and so much tasty chili flakes. Gotta give your recipe a try! I’ve only ever had shrimp cocktail for an appetizer and I love it. These sound and look really good! Good old shrimp cocktail is my go to! That cooking set is gorgeous! Shrimp cocktail – a classic! This is such a cool recipe! As a kid I loveeeed just simple shrimp cocktail! This looks great – brings back all of my Maryland memories with a cool new twist. My favorite shrimp appetizer is coconut shrimp fritters. Combine finely chopped shrimp, bell peppers, coconut and binder, pan fry or bake, then serve with a spicy jalapeno jelly. Easy! I like shrimp cocktail. We always ate it on Christmas eve so it brings back good memories. I like big shrimp with cocktail sauce! Yum! Anything with shrimp and grits has to be delicious! Ok, this is seriously genius…yummm! Shrimp spring rolls, for sure! Blue-cheese stuffed shrimp 🙂 Slice them along the back and stuff with beaten cream cheese, shallots, parsley and mustard powder (and blue cheese of course!). Then devour! Omnomnom. wow you make it look so easy, must try. I have always stick with shrimp cocktail, but I think if I try to make this it will be my new favorite! shrimp ceviche makes the best app! I am always a fan of veggies and dip. So simple, but so many different options. To echo what everyone’s already said – that’s a really unique idea! I’m interested to know how you seasoned the shrimp? I’m sure there are loads of seasoning combos that would pair well with the Old Bay dipping sauce. We just sprinkled it in Old Bay since it’s pretty salty and has lots of flavor. This looks SO good! 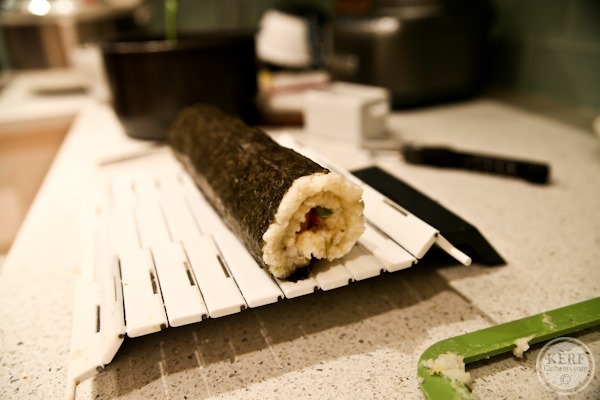 Must go buy a sushi mat and try! I love shrimp avocado and mango stacks! I love unexpected sushi flavors! Thanks for sharing. I have never had any interest in making my own sushi…until now. That looks absolutely delicious! What is neat looking dish! This sushi looks so tasty and I love bacon-wrapped shrimp! Also, the cookware is gorgeous! I love everything shrimp and can’t wait to make this recipe! A fun, creative recipe-love the addition of grits! Thanks for the recipe and the give-away! Shrimp cocktail is my favorite!! coconut shrimp with piña colada dipping sauce???? My favorite is classic shrimp cocktail – you really can’t go wrong! Love the classic shrimp cocktail appetizer. Sweet and simple….. While it wasn’t an appetizer, I had a great shrimp and grits dish in San Francisco a couple years ago. That’s something you don’t find a lot of here in California. I also like (a lot!) honey walnut shrimp from Chinese restaurants. Your sushi looks great! This recipe looks delicious! We will be trying it this week, I love shrimp! Also thinking of some other yummy dipping sauces. Hoping to try this soon. 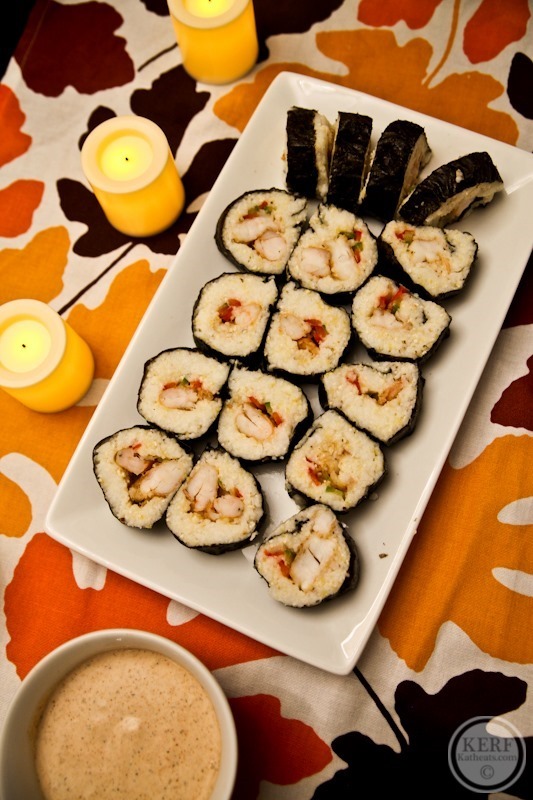 A huge sushi fan, I’m sure this recipe would make for such a fun twist on an old favorite! Mexican shrimp cocktail is a favorite at our house, it combines two favorites: Shrimp and avocado! I’m a vegetarian but I think my husband would say coconut shrimp! I don’t know if I have a favorite shrimp appetizer — I haven’t seen too many! I do love shrimp scampi as a dinner though! juuuust starting to like shrimp so no favorites yet!! My uncle always brings plain old shrimp cocktail for Christmas appetizers, so good! Coconut shrimp! Hm m now I’m hungry for seafood, and sushi, uh! You can’t really go wrong with shrimp, I’d say my favorite shrimp appetizer is probably panko crusted shrimp or coconut shrimp! I’m also super into using shrimp instead of chicken or steak for fajitas! I love a good ‘n spicy shrimp cocktail with avocado! Truth be told, I love anything with shrimp! Anything! And I love teal! How cute is that cookware??? I love it! Those are the cutest pots I have ever seen! Great job making sushi :). I’ve been seeing Rachel Ray stuff discounted everywhere lately! It was on sale at the Christmas Tree Shops, I got a message from Zulily about a deal, and now this giveaway! Is she going out of business or something? coconut crusted shrimp is def. my all time fave! Such an interesting take on sushi. I would love to try this sometime. I pretty much love all shrimp but just grilled with some lemon is my favorite! Looks YUMMY! Classic shrimp cocktail is my favorite. I love pretty much anything with shrimp in it and this recipe looks delish! Old bay dipping sauce??? Brilliant! Coconut shrimp with mango salsa! We eat a lot of shrimp and keep it pretty simple. My favorite is dipping them in different sauces. I usually just east shrimp cocktail. This looks easy and yummy! I like shrimp cocktail. I also had a grilled shrimp skewer app in Miami that was amazing! Love a bite sized shrimp Cesar salad I make as an appetizer. Always a crowd pleaser!! This looks delish. I’ve only used Old Bay in making low country boil, so I’d love to experiment with it in a dip! I am a vegetarian and don’t eat shrimp but I do love me some grits! I love shrimp cocktail, with the shrimp broiled. Ashamed to say I’ve never had shrimp & grits before-will have to remedy that asap! YUM – that old bay dip looks awesome. Such a fun idea! I love making homemade sushi. I’ll have to give this one a try! I have to pick one??? It would have to be a toss up between coconut shrimp and shrimp cocktail. I don’t discriminate when it comes to shrimp. I love them all! I love a good shrimp cocktail. Easy and low cal way to start. This looks so fun! I think good old shrimp cocktail is my favorite. My favorite shrimp appetizer is baked jalapeno shrimp “poppers”! Halve and clean the peppers, oil, and roast a bit to soften on a sheet in the oven. Fill with cheddar, shrimp, a light dusting of cumin, and either wrap with bacon or top with seasoned breadcrumbs and bake to appropriate food safe temperature. Serve with salsa. Mmmm, Tex-Mex goodness from Austin, Texas. My @jennyfluteplaye twitter acct was hacked, so I followed on my other account @radiantsoulyogi instead. In the contest entry, I said I followed on jennyfluteplaye. Sorry for any confusion. Shrimp cocktail is one of my favorites, with a spicy cocktail sauce! Shrimp cocktails are the best! I don’t know that I have a favorite shrimp appetizer . . . maybe coconut shrimp? But I love pretty much all cajun/creole shrimp dishes – shrimp & grits, barbeque shrimp, shrimp creole . . . I wonder if we could sushi those?!?! I love a bit of cream cheese topped with shrimp and the spiciest cocktail sauce you can find. I would say just some good old shrimp, breaded and fried with some cocktail sauce….not the healthiest but still delish!! My favorite shrimp appetizer is anything made with shrimp. Love all things shrimp. I’ve never tried grits before but…sushi! This sounds like a great intro-to-grits recipe! I like my grandma’s fried shrimp!!!! I just started eating shrimp, so I don’t have a favorite yet! I love the classic simplicity of shrimp cocktail- and it’s always easy/fun to switch up the presentation! i love shrimp and grits and i love sushi, i bet this is awesome. Thanks for sharing! Just cocktail shrimp – I could eat them like candy! how fun is this??!! I love the idea. My favorite shrimp appetizer probably is a tempura roll! My favorite is jumbo shrimp cocktail! I love coconut shrimp. Yum! I recently tried shrimp for the first time…time to try some classic shrimp cocktail! Coconut shrimp with a spicy papaya sauce! Love a spicy shrimp cocktail! I love shrimp cocktail and coconut shrimp! Thanks for the chance to win! Shrimp cocktail with a really good sauce! 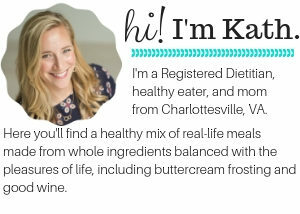 wow – this looks delish, Kath! Thanks for sharing! I LOVE shrimp!! My favorite shrimp appetizer is a layer of cream cheese, layer of small shrimp, and a layer of cocktail sauce. Dig in with some crackers! I love bacon wrapped shrimp! Just a simple shrimp cocktail is my fave!